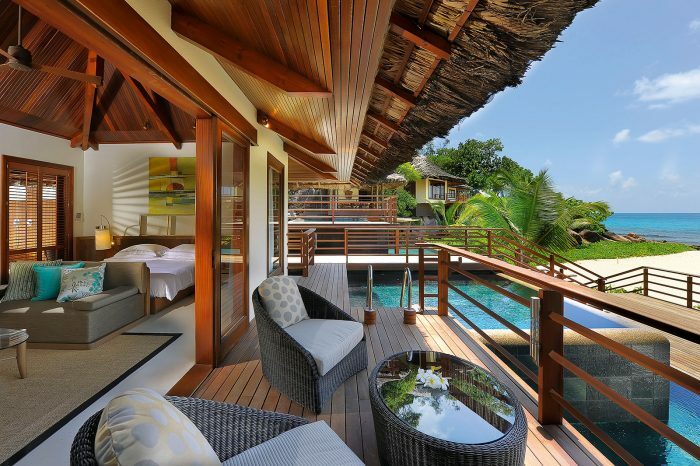 The Seychelles resort of Constance Lémuria is a gem amongst a verdant environment. The resort perfectly merges with its natural surroundings, providing luxury accommodation in 101 hectares complete with an 18-hole championship golf course. Stay in one of 88 Junior Suites, 8 Senior Suites or 8 Villas with private pools. You can also choose the resort’s only Presidential Villa, with three bedrooms and the very best luxury fittings and furnishings. Four restaurants provide plenty of choice for dining, with The Seahorse overlooking the 18-hole golf course. Enjoy buffet meals at The Legend or casual seafood dining at the Beach Bar and Grill, followed by a relaxing treatment at the U Spa to rejuvenate and invigorate. An on-site hair salon, a gym, two tennis courts and facilities for outdoor activities and water sports are to be found within the resort, whilst boutique shops stock many luxury products to purchase during your stay. Children aged between 4-11 can take part in the Constance Kids’ Club. Some of the above activities and facilities do involve additional fees, for further details please contact one of our travel experts. The “Lémuria Private Collection” boutique sell exclusively designed clothing, in addition to items such as sun creams and souvenirs. The “Pro Shop”, have a range of golf products available. For golf loving couples the Constance Lémuria, with it’s 18 hole championship golf course, must be top of their list. Even for non-golfers the array of water sports and activities on offer make for an invigorating stay. With the help of the PADI Diving School, scuba dive and explore the colourful underwater life of the Indian Ocean, creating lasting memories. Pamper yourselves with a couples massage from the Shiseido Collection. This collection includes holistic treatments crafted said to balance the vital energy in the body. Make sure to make time to immerse yourselves into stunning landscape surrounding the Lémuria resort. Our Honeymoon planners have access to the latest Honeymooner Offers for the Constance Lémuria. Call us or complete the Honeymoon Quote form for more information. With a choice of 4 restaurants and bars, there is plenty to indulge your taste buds with. The Legend – Positioned in the main building and seating 120, this restaurant serves both breakfast & diner buffets, and a choice from à la carte menus. The Seahorse – The Constance Lémuria’s premier eatery hosts 60 places, offering authentic Seychelles cuisine. Set in a garden, you will find this restaurant to have a more intimate feel. The Beach Bar & Grill – Enjoy the breathtaking views of the beach Petite Anse Kerlan, and savour some of the specialties of this seafood restaurant, including catch of the day. Takamaka Restaurant – Named after the famous Takamaka trees that give shade to this amazing beach side restaurant. Each of the 4 restaurants include bars serving a host of exotic drinks and cocktails. For when relaxing poolside, the sunken Pool Bar offers light lunches, refreshments & cocktails.